Installation of fixed anchors implies a strong responsibility which you should only take if you have suitable experience. The information given here is not to be taken as the be all and end all of bolting facts. This is advice only and the author is not responsible for inaccuracies , mistakes or accidents caused by using this information. Never assume that the person selling the product (or other climbers including us) are giving the right advice. Read the product manuals and contact the manufacturer if there are any doubts. Before placing bolts in a cliff you must practice at home. Find a piece of portable rock or use your garages cement foundation as a test block. Practice drilling, notching, placing and removing an example of all these types of bolts before deciding on a system. Remember - do not trust the guys in the bolt shops to tell you the right information. They have no idea about dynamic loads related to climbing and will recommend equipment that is not suitable. Bolts need to hold loads up to 25kN. This guide will steer you towards brands that people have been using successfully for years in Australia - it is then up to you to read the technical manuals for the product and follow the instructions exactly. Contact Neil Monteith if you need any more info. 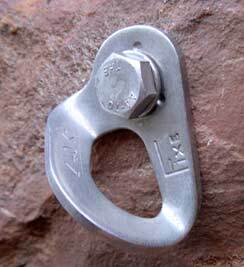 For tips on placing these bolts in a climbing environment check out the Bolting Guide. Check placing Rap Anchors as well. You should always place the fattest and longest bolt that's practical. When you're using a power drill or bolting by hand on rappel there's no excuse for placing a flimsy bolt, and at a minimum you should use a 10mm by 50mm bolt in hard rock (Buffalo), 12mm by 75mm in medium rock (Grampians, Camels Hump, Arapiles), and a 12mm by 100mm glue-in bolt in soft rock (Werribee Gorge, Bullengarook Quarry). Expansion bolts are easy to place, strong and readily available. Mechanical bolts work by either expanding of compressing - gripping the rock by pressing against the wall of the bolt hole. 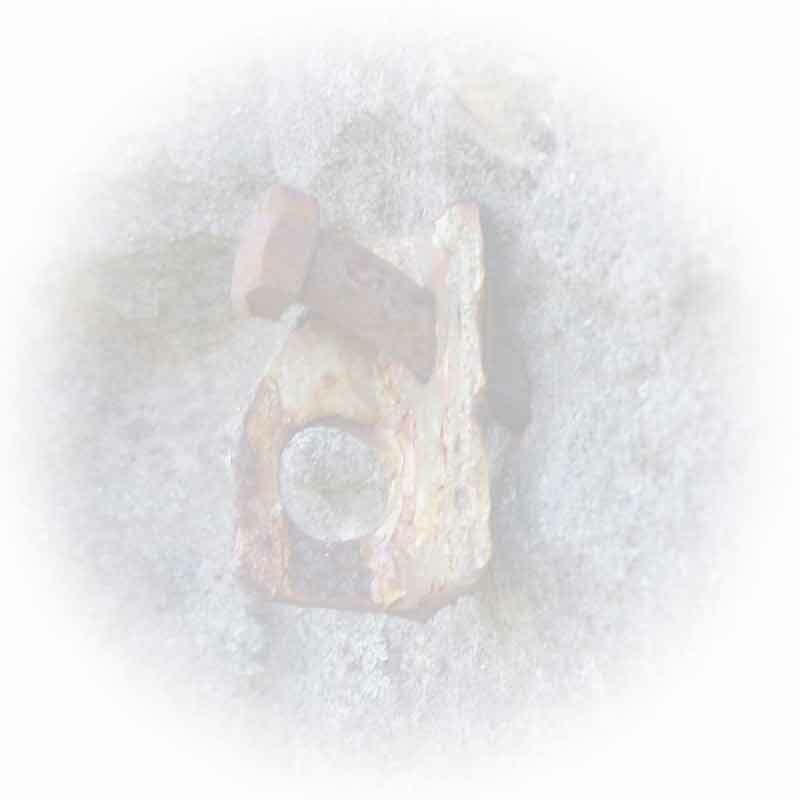 The pressing action creates friction between the anchor and the rock; for the bolt to pull out, the applied load has to overpower this coefficient of friction. Expansion bolts are expensive as a unit as you have to purchase a commercial hanger on top of the expensive bolt. If you are only placing a few bolts then expansion anchors are the best place to start as the cost outlay for tools is very small compared to glue in anchors. Glue in rings are the strongest and most hard wearing of all the bolt types. They are complex to place however and involve quite a bit of expensive equipment to place. For a ring with a rod diameter of 10mm - a 12mm hole must be drilled and a large notch to recess the ring must be drilled. They must be recessed to stop the ring twisting out of the hole. You can only use injection gun glue with rings as the capsules never have enough glue to fill the notch. Most ring bolts placed in Australia are homemade. If you can weld and bend stainless steel then you could consider making your own. 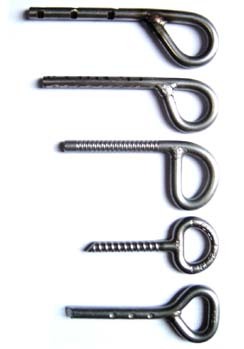 Before use it is important to prepare the ringbolt so it achieves maximum bond with the glue. Wash the entire ring with soapy water to remove any grease. This removes any residual chemicals left over in the manufacture of stainless steel. Brush the entire surface of the bolt with a wire brush or rounded file. This creates a rough surface which the glue will bond to. 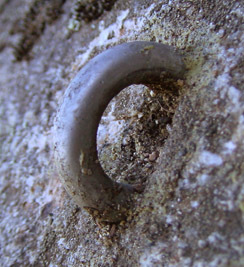 If the ring has less than four surface notches then it is recommended to add some extras using an angle grinder or hand file. The notches stop the ring from turning in the hole and breaking the glue bond. U-bolts are by far the cheapest of the bolt solutions if you are bolting steep rock. They are moderately easy to make at home - using 10mm 316 stainless steel rod. The biggest problem is their high visibility and the requirement to drill two holes per bolt. One of the biggest advantages is that they usually require light hammering to get them into the two holes which means they stay in the rock when the glue is drying - which is great when bolting roofs. You can only use injection gun glue with U-bolts as you cannot spin the bolt into the capsule. 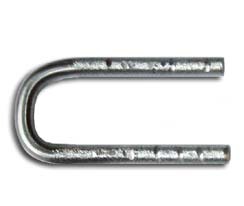 U-bolts have been known to fail in very soft rock because of the close distance between the two legs. Most U-bolts have a minimum leg spacing of at least 45mm. Before use it is important to prepare the U-bolt so it achieves maximum bond with the glue. Wash the entire U with soapy water to remove any grease. This removes any residual chemicals left over in the manufacture of stainless steel. Use a bench grinder to grind the entire embedded surface, and a cutoff saw or angle grinder to put notches in the bolt which will allow the glue to bond properly. 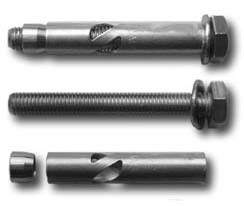 Bolts not properly prepared can fail under very low loads. NOTE: Be careful to ensure that your holes are straight and the U-bolt fits without excess hammering required. The stress this places on the metal has led to premature stress corrosion cracking (SCC) and complete bolt failure. A well recessed 10mm U-bolt, with a messy glue job. Take lots of rags! If you are placing ring bolts and U-bolts then you must use an injection glue system. 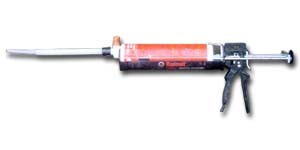 Most bolt manufacturers produce high quality glue which is deposited using a brand specific caulking gun. The two parts of the glue are mixed through a nozzle and the end result is perfect mixed glue which dries in a few hours (polyester) or overnight (epoxy). If you are placing a lot of bolts then a glue system is certainly a cost effective method. It is very messy and requires diligent attention to detail and quality control. The easiest way to make an obvious, messy and bad bolt is to try and place rings without practicing first! Of all the systems this one requires reading in detail the manufacturers installation guidelines. 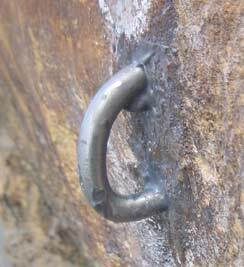 Glue in anchors transmit the load of the anchor over a wider area of rock than expansion bolts ever can. This means that the load is spread over the entire area that the glue bolds with the rock. This is turn means that the anchor is more reliable in general because it is usually impossible to visually identify internal rock fault lines. We use and recommend the listed epoxy-based glues because they are non-porous and come with ETAG (European Technical Approval Guideline) certification giving a life expectancy of 50+ years for use in life critical applications. Polyester and Vinylester Glues (half the strength of epoxy, and shorter lifespan - no longer considered good practice to use, despite widespread continued use). We recommend all route developers cease using non-epoxy adhesives!